All males inherit Y-chromosomes from their father - through his father, his father, his father, etc - represented by the direct paternal line as per the blue boxes on the chart below. Only males have Y-chromosomes, so only males can take a Y-DNA test. If a male has an exact match with another male who has tested, it indicates that they descend from the same male somewhere back in time - but it can't necessarily tell you where and when, as the Y-DNA can remain unchanged for hundreds of years. Occasional (harmless) mutations can help define particular branches, as once a mutation occurs in a male's Y-DNA, it is passed down subsequent generations on that line. The pedigree chart below shows (in blue) males who could potentially share the same Y-DNA - providing there are no NPEs (non-paternal events, such as illegitimacies, adoptions etc). A male could potentially share a Y-DNA match with any direct male descendant from any direct male in the pedigree, going back many hundreds of years, not just the generations shown in this chart. Females can test a male relative (eg. father, brother, uncle, cousin) to determine their paternal ancestry. You are not restricted to testing the Y-DNA of your own paternal line. If you can find a willing male relative from any other surname/paternal line in your tree (eg. your mother's paternal line), you can test his Y-DNA to investigate that line genetically too. In the chart below, for example, you could test a maternal uncle or cousin to determine the Y-DNA of your maternal grandfather's paternal line. Barring NPEs, you just need a male that shares the surname that you want to test. Y-DNA testing examines a number of known markers (positions) on the Y-chromosome, and a numerical result is given for each marker. Testing is available at different levels - 37, 67 or 111 markers. The higher level tests will give a more detailed result. The specific combination of resulting values will determine the Y-DNA haplogroup - which denotes the broad population group those paternal ancestors belonged to. The sample Y-STR results above are for 37 markers, and predict a common Y-DNA haplogroup of R-M269. These marker values can be used in surname and geographical projects to compare values between men with the same surnames and men from the same geographical regions. Because Y-DNA generally follows the surname line, testers can join a FTDNA surname project to compare origins of other men with the same surname. Y-DNA generally remains unchanged, but occasional mutations (harmless) can help define particular branches, as any such mutations will continue to be passed down the successive direct male line. Connecting paternal lines where no paper/traditional records are available. Determining if males (or families) with the same surname are related. Determining the earliest known origins of a paternal line, by connecting with others who have researched their line further back. Males with unknown fathers (eg. adoptees; donor-conceived) can sometimes determine or get an indication of their biological father's surname through their Y-DNA. Paternity issues: Do siblings have the same father? Which husband of a female ancestor who married more than once was the father of particular children (eg. surnames of young children may have been changed)? In combination with autosomal testing, it can help determine if prevously-unknown cousin matches might be related on the paternal side of the family - or at least help by disproving relationships. Refer to Family Tree DNA's information page on Y-DNA Basics. Click the chart below to go to FTDNA's interactive Y-DNA probability chart, which estimates the number of generations to the common ancestor at different testing levels. 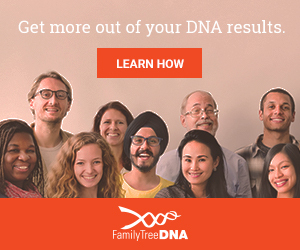 Y-DNA tests are only available from Family Tree DNA. Also read about mtDNA testing - the direct maternal/female line, and atDNA testing - to find matches on all ancestral lines. What does a FTDNA test look like and how do I use it?